The Argyle diamond mine, which is owned and operated by Rio Tinto, is one of the most famous and valued diamond mines on earth, and considered the premiere source for pink diamonds in the world. The mine is also well known for its production of red, violet, and blue diamonds. An active mine since 1983, the recent news is that Rio Tinto has moved to above ground mineral deposits and that the Argyle mine will be closed by 2018. This means that almost all of the gem quality diamonds that exist in the mine are already depleted, and anyone who already owns an Argyle diamond is lucky. Every year, the Argyle diamond mine and its management put all of their efforts into presenting the mine’s finest and rarest diamond finds of the year in an exclusive, invitation-only tender-style auction. The crowing jewel of the much-anticipated annual tender is the mine’s “hero collection”, which is a collection of the top 5 diamonds or fewer that were mined throughout the year. These incredible fancy colored diamonds are chosen based on their appearance and overall characteristics and are the most coveted diamonds that appear annually on the diamond market. According to Argyle Diamonds, only approximately 20,000 carats out of about 130 million, or 0.01%, of the carats mined yearly are of a pink hue. If we account for an average loss of 55% of the rough diamond to get to the polished final result, that further reduces the count to just 9,000 carats of polished diamonds! Argyle diamonds claims it produces in excess of 90% of the global pink diamond supply. In a single word, this can only be described as rarity. If we gather all the Argyle diamonds (of pink hue) that are above 0.50 carats produced each year, we would be able to hold them all in merely one hand. 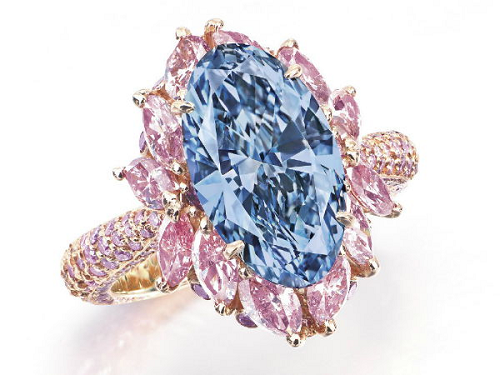 The majority of the pink diamonds that are unearthed are under 0.08 carats in size, which size is also known as “melee”. These are used in rings to decorate an important single center stone, in most cases a rare green, blue or larger pink diamonds. Argyle Diamonds are the most known and coveted diamond brand in existence. Other strong diamond brands do exist such as the well-known De Beers brand Forevermark, Harry Winston, or even the single diamond cut known as the Asscher cut, which was created by the Asscher family, a long and multi generation family within the business. But none is more known, desired and appreciated than Argyle diamonds. The Argyle diamonds brand is so strong, that even though the industry as a whole has had many turbulent times in the past 4 decades, and even as it tries to transforms itself and rejuvenates with a new tag line “real is rare” newly minted just a few short months ago by the diamond producers association (DPA), Argyle diamonds has always managed to stand apart and on its own throughout its 33 year history. The first question that someone will ask about a pink diamond is “Is it an Argyle?” and pink diamonds from Argyle automatically have a higher cost per carat than other pink diamonds on the market. This tender is the finest and rarest in its history. 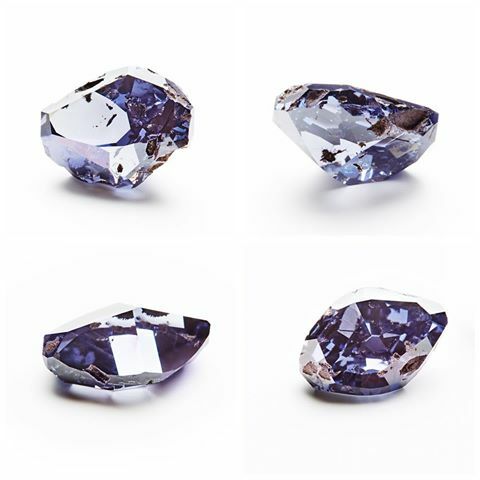 The star of this year’s tender is the Argyle Violet, the largest violet diamond that was ever produced by the Argyle mine, the only source of hydrogen-caused violet diamonds in the world. 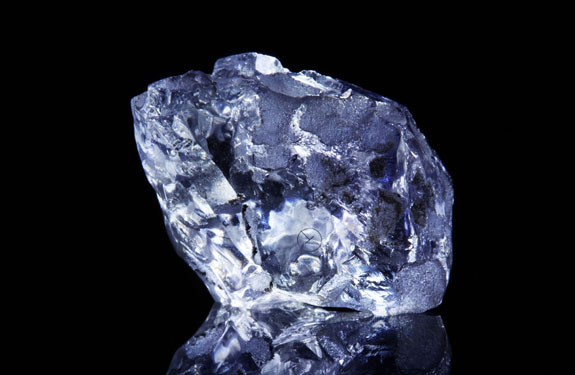 For every 25 million carats of rough Argyle diamonds, only one polished blue or violet tender stone is produced. 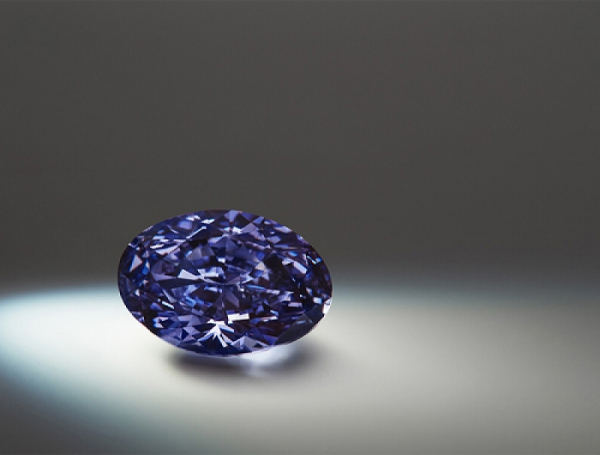 Only 12 carats of polished violet diamonds have been offered since the start of the Argyle tender in 1984. 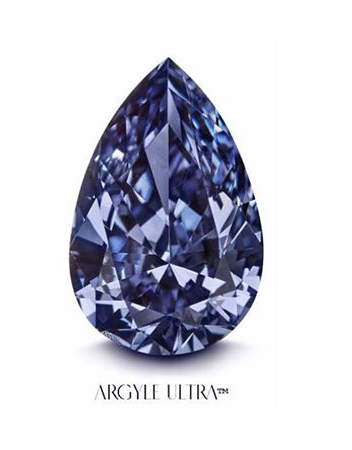 The Argyle Violet is a 2.83 carat Fancy Deep Grayish Bluish Violet SI1 oval shaped diamond. It is joined in the Chroma collection with the Argyle Ultra, a 1.11 carat Fancy Dark Gray-Violet VS2 pear shaped diamond. Of the 57 pink diamonds that earned their place in the 2016 tender, only 2 pink diamonds were granted “hero” status. 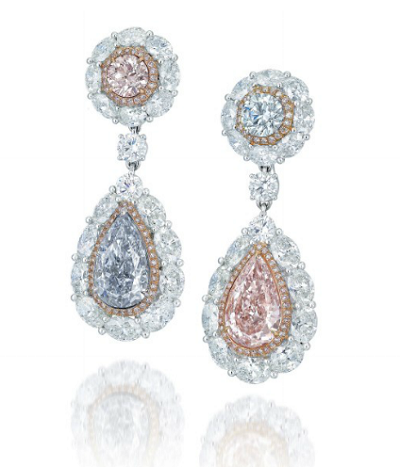 These truly exceptional pink diamonds have exceptional color, carat sizes, and clarities. 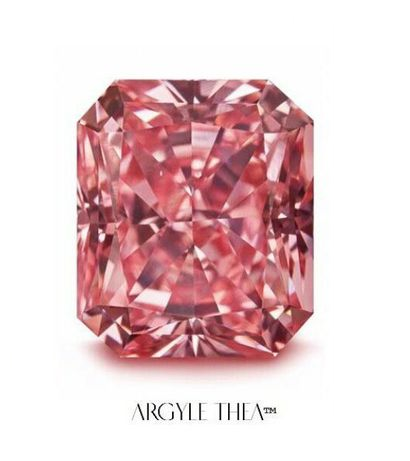 The first is the Argyle Thea, a 2.24 carat Fancy Vivid Purplish Pink VS2 radiant shaped diamond. 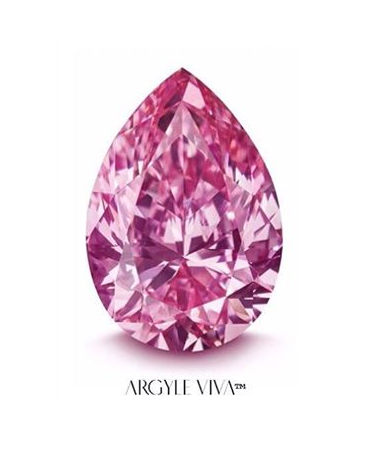 The second is the Argyle Viva, a 1.21 carat Fancy Vivid Purple-Pink VS2 pear shaped diamond. In the last few months, Rio Tinto, the owners of the Argyle mine, has announced the launch of the “Provenance Report”. This report will allow consumers to know exactly where each diamond was mined at the Argyle diamond mine. The idea for the Provenance Report developed because more and more consumers are social justice conscious and want to be sure that their diamond has been sourced from non-conflict mines. Diamonds from Canada are similarly ensured to be non-conflict diamonds for their consumers. 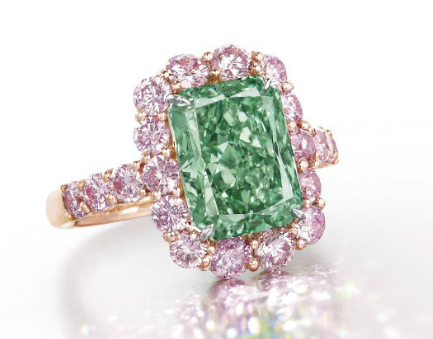 The idea of provenance reports originated in the art world to enable buyers to track the owner history of a work of art and inspired Rio Tinto to do likewise with Argyle diamonds. Although Argyle diamonds appeal to the entire world on many levels, this extra level of reassurance for buyers will only cement Argyle diamond desirability among an even larger audience, who will include those people that (rightfully) insist on proof of conflict-free mining standards. For at least the last two decades, investors have understood how Argyle diamonds have been seen as an asset class of their own when it came to diversifying their investment portfolios. Due to rarity and high demand, investors have been slowly, gradually and securely adding diamonds, and more specifically fancy color diamonds (FCD) to their portfolios, while reducing the overall risk of the portfolio. 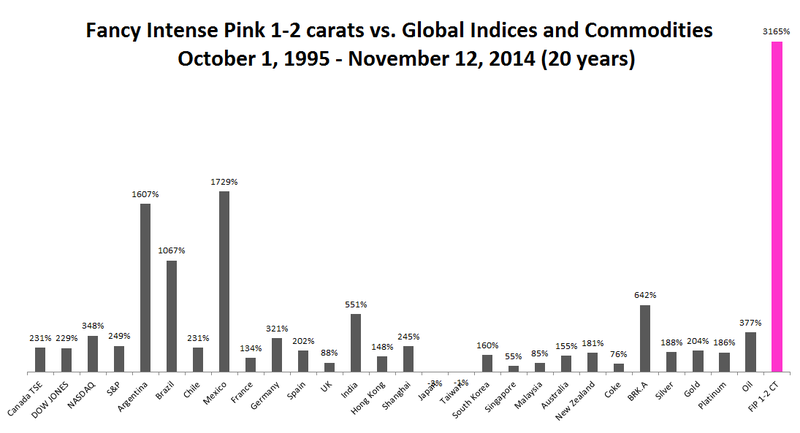 In addition, returns from fancy color diamonds, especially pink diamonds, have been superior to other assets over a longer period of time. We have written extensively about this, proving exactly how much diamonds have been appreciating over recent decades. Argyle diamonds are in such demand that they are almost never sold at auction. We have scoured the data from countless auctions at all of the major auction houses in locations all around the world and it is interesting to note that they are just never resold. The explanation is simple: those who buy them do not want to let them go. Their owners all apply a buy and hold strategy to their purchases because they know how much more valuable their Argyle diamonds will be in the future than they are today. Only about 5 diamonds from the thousands of diamonds that have been sold over the last half century have been Argyle diamonds. Three of those diamonds were the highly coveted color red, which is extremely popular at auction and which indubitably explains why anyone would offer an Argyle diamond at auction nowadays. Red diamonds command some of the most unbelievably high record prices, especially when sold at auction, so anyone with a valuable red diamond is understandably motivated to sell at auction when the circumstances allow. In fact, three of the top five red diamonds ever sold at auction were Argyle diamonds, reinforcing the fact that Argyle red diamonds are valuable and desirable indeed. The most notable Argyle red diamond sold at auction was Lot #11 from the 2013 tender, which was originally a 1.66 carat Fancy Deep Pink diamond that was repolished to a 1.42 carat Fancy Red diamond with VS2 clarity and sold for $2.165 million when it was valued at a price between $1.5 – $2.5 million. 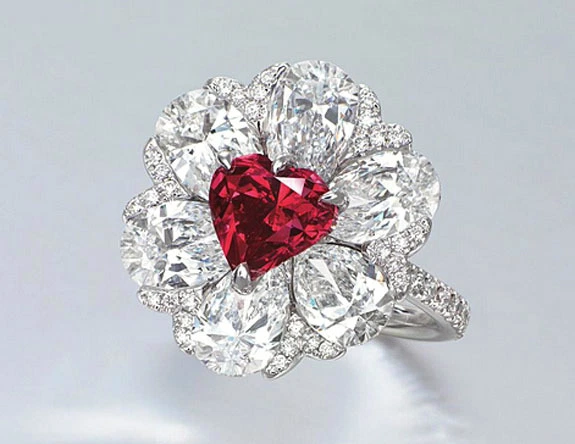 The other Argyle red diamond is the 2.09 carat Fancy Red heart shaped diamond that was set by famed jewelers Moussaieff in a diamond ring and sold at auction in Hong Kong for $5.1 million. 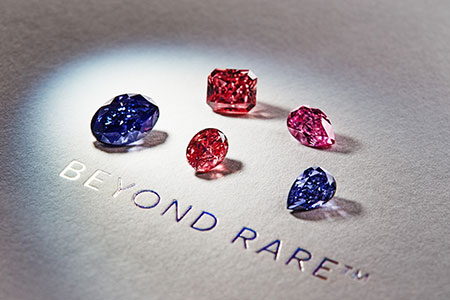 The diamond was Lot #49 from the 1992 tender and was classified at the time as a Fancy Purple Pink, although in 2014 it was reclassified as a Fancy Red. 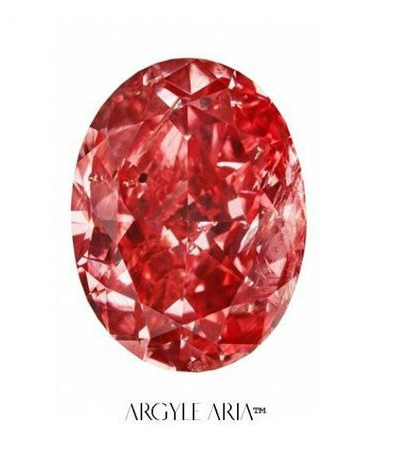 The third Argyle red diamond was a 1.61 carat Fancy Purplish Red diamond tender stone from 2009 that sold at auction in 2013 for $1.57 million. (The other 2 red diamonds from the top five are the 1.92 carat Fancy Red diamond that sold at auction in 2013 and the 2.26 carat Fancy Purplish Red diamond that sold at auction in 2007). Generally speaking, the diamonds at the Argyle tender are present for their color and size, and less so for their cut and clarity. Those that follow the annual Argyle tender and its fine, rare diamonds will most likely not remember the last time any tender diamond had an Internally Flawless clarity! When I first saw the IF diamond on this year’s list of tender diamonds, I wondered if it was a typo….it was not. During the last 33 years of the tender, only once or twice did a tender diamond have an IF clarity, and none of these has appeared since the 1980s! The last lot of the tender, Lot #63, is a perfect 0.71 carat Fancy Intense Pink emerald shaped diamond with the Internally Flawless clarity. I believe bidding for this fine, unique and perfect diamond will be quite intense to say the least. This piece is a true once in a generation event. This year, the average size diamond stands at 0.92 carats, compared to an average size of 0.68 carats last year, totaling a 35% increase. This fact is significant for both the Argyle mine as well as for diamond collectors and investors. 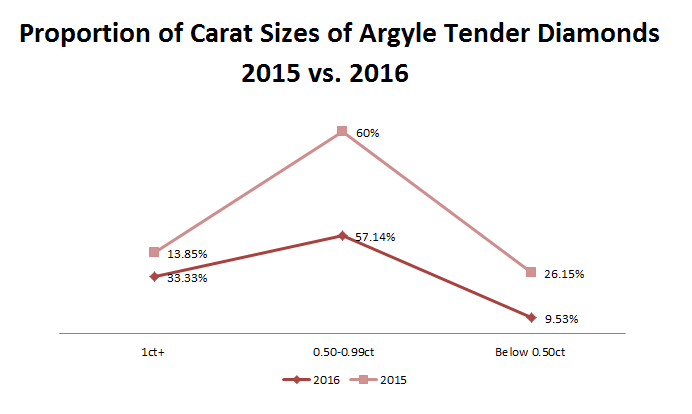 A total of 57 out of 63 tender diamonds this year are 0.50 carats in weight or more. These 57 diamonds have a combined weight of 55.52 carats or 0.974 carats per diamond on average. There are no diamonds under 0.40 carats in this year’s tender. 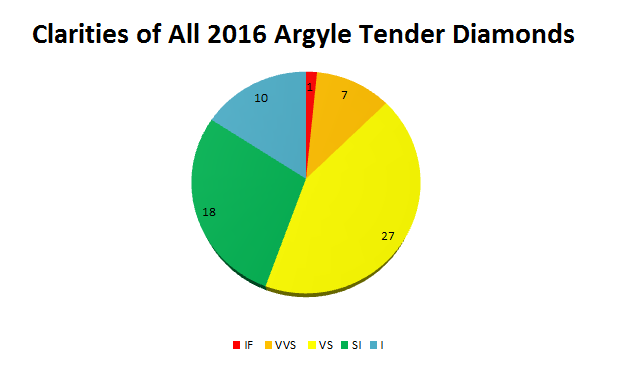 The last time the average of the argyle tender was above 0.90 carats was back in 2008, which average stood at 0.98 carats. Only a handful of times the average was higher than 1.00 carats, the last time was back in 2001 where the average stood at 1.02 carats. The lowest average since the 1990s was in 2012 where it stood at 0.61 carats, but that year we also saw the most significant quantity of blue diamonds, the “Once in a Blue Moon” collection. That year also produced the highest amount of tender diamonds, a total of 70. Argyle diamond supply is running thin and time is running out for the famed mine in Australia. By 2018, no new Argyle diamonds will be on the market and anyone who then seeks to buy an Argyle diamond will be faced with the reality that the decreased supply will mean a higher price. Although the mine is closing soon, it is interesting to note that the average size of the diamonds currently on display is actually one of the largest in decades, and the clarities are some of the highest in decades. These facts only serve to cement the reality that the Argyle mine produces some of the most impressive diamonds in the world, not only because of their color but also because of the other 3 C’s as well. It would be one matter entirely if all that they managed to produce so close to the closing date would be tiny diamonds of mediocre quality, but that is not the case. Argyle is still continuing to produce incredible diamonds, and it is only serving to fuel the demand and energy that surrounds these gems. Now the only question that remains is which lucky bidders can afford these diamonds and how much they will resell for when the owners decide to cash in on their investments! Got any questions about Argyle diamonds or Argyle diamonds investment? Ask us in the comments! Diamond Investment Review 2017 And 2018 Outlook– Was 2017 What The Industry Hoped For?